As a new customer based in the UK, you can take advantage of the Mobilebet Voucher Code. You can get up to £50 in free bets (T&Cs apply) for the sportsbook. How to do it? Place a bet with a stake of £10, the odds have to be at least 2.0 (evens), and you’ll qualify for a £10 free bet token. You can do this up to five times! Terms & Conditions apply and remember this offer is triggered with the Mobilebet voucher code. This offer also grants you with 20 casino spins on Starburst. Mobilebet is a relatively recent addition to the online bookmaker sector. It provides casino and live casino gaming opportunities and an extensive selection of sports, leagues, in-play betting, and markets to bet. Their products are available on desktop, mobile, and tablet. Mobilebet also offer bonuses and free bets based on a points system for each product within their range. This review aims to advise new and existing players on the best way to benefit from the operator’s range of sports products, sports offer and promotions, and Mobilebet casino. The first step for new players is to open an account following a fairly simple sign up procedure and quote the Mobilebet Voucher Code MAXBETBONUS. Casino customers can take advantage of another exclusive sign up offer. However, the two offers cannot be paired. Customers have to choose between the Mobilebet sports offer described above or the casino offer. The casino new customer bonus works this way: you can get a 100% bonus up to £100 on your first three deposits (wagering & T&Cs apply). The minimum amount to deposit is £10 and wagering requirements apply. For this offer you have to use the Mobilebet casino voucher code MAXCASINOBONUS. This promotion also gives you the chance to get 25 casino spins on Starburst. 1. This offer is open to new UK mainland customers only. 2. This offer is valid from 00:00:00 CET 27th September 2017 until 23:59:59 CET 31st December 2017. 3. This offer cannot be used in conjunction with any other Welcome Offer. 4. Upon registration, you may choose which Welcome Offer you would like; Sports or Casino. 5. Minimum deposit is £10. 6. Deposits made via Skrill/Moneybookers, Neteller, Paysafecard, Webmoney and Ukash e-wallets are excluded from this offer. 7. Mobilebet will double your first three deposit up to £100. 8. The maximum bonus you can receive is £100 on your first three deposits. 9. Minimum wagering requirements apply. You will need to wager your bonus before you can withdraw as follows: 10. Casino: 35x bonus and deposit amount. A. You cannot combine Sportsbook and Casino to achieve the minimum wagering requirements on this bonus. B. Stakes on some of our casino games don’t count in full towards the wagering requirement. Instead, they have a percentage contribution outlined as stated here: 11. Mobilebet Terms and conditions apply as stated here. Claim your Mobilebet Bonus Here! Sports betting new customer offer for the United Kingdom only. Get up to £50 worth of free bets. Qualify by betting £10 on a bet with odds of at least 2.0, and get a £10 free bet token. You can do this up to 5 times. Further terms and conditions, as well as specific requirements, apply. 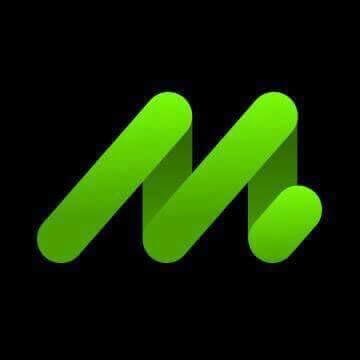 Exclusive Mobilebet voucher code MAXBETBONUS is required to claim the sports bonus. Exclusive casino offer for new customers in the United Kingdom. Deposit a minimum of £10 to trigger the offer. You can get a 100% matched casino bonus from Mobilebet. Wagering requirements apply as well as Terms and Conditions. Casino stakes of 35 times the deposit and bonus required. Exclusive Mobilebet voucher code MAXCASINOBONUS is required to claim the bonus. Mobilebet Points – Don’t miss out! Earn points in different ways. Be it logging in, depositing, betting and withdrawing. Points can be used in the Mobilebet shop only. Redeem points for the latest offers and promotions shown in the shop. Full details are only available to registered customers on login. Licenses: Licensed with the UK Gambling Commission and the Malta Gaming Authority. Currency: Euro, US Dollars, British Pounds, Norwegian Krone, Swedish Krona and Australian Dollars. Restricted countries: Australia, Croatia, Curacao, Czech Republic, France (incl. territories), Hungary, Ireland, Netherlands, Poland, Portugal, Romania, Spain, USA (incl. territories), Turkey. Markets: United Kingdom and Northern Europe. Services: Sports, live betting, casino, live casino, promotions, betting rules, results, statistics and live results. The Mobilebet sportsbook is part of the Co-Gaming company that also runs the ComeOn brand which provides an established casino and sports betting operation. Mobilebet main focus is to provide an excellent sports betting and online casino gaming experience. To achieve their aim Mobilebet provide services that can be enjoyed on mobile, tablet and desktop. In general, the website user experience and functionality is good. Mobilebet sports offer includes all the main sports betting options the average punter would expect. With daily live bets for the most popular live betting sports, and competitive odds, there is a lot to like about Mobilebet. Perhaps the best aspect of the brand is that customers are rewarded for their loyalty with collectible points which can be used on selected promotions. As already mentioned the Mobilebet Voucher Code is available to use for new customers who sign up at the site (T&Cs apply | 18+). The offer is competitive when comparing to other bookmakers. In terms of security, due to operating under license in the UK, Mobilebet must meet legal requirements in terms of providing a service that is clearly fair and transparent. The Sports homepage includes a search facility where you can search a team or player’s name and associated bets will display. An in play button is highlighted in green and links to the live betting events. Top Events include the main soccer leagues and competitions. Today’s Events links to the markets currently on the site. The odds are listed under 30+ sports. With football at the top, sports are placed in order by the number of existing markets. Football accounts for a large portion of online sports wagering, both live and pre-match. The Specials section includes odds for politics and entertainment. The relatively new category of E-Sports appears at the bottom of the list of sports. The majority of markets are related to football, basketball, and tennis. The football sub-menu lists over 50 countries including all the major football playing nations in Europe and South America. An international section includes friendlies and youth matches, transfer specials and odds for the winner of the Ballon d’Or. It is the prize awarded to the best player in the world each year. In terms of the number of leagues on offer, the United Kingdom is the most comprehensively covered country. It has odds for several leagues including the four English professional ones, other further down the hierarchy and the main leagues for Wales and Northern Ireland. Scotland is part of the UK but has its own listing. The English Premier League is the most watched, covered in the media and bet on in the world. For each upcoming fixture, the 1X2 is displayed with links to about 100+ additional markets in some of the following categories: All Markets, Main, Goals, Halves, Corners, Period, Specials, Cards, and Outrights. The date and kick-off time are shown beside the team names. The statistics section shows recent form and head-to-head meetings, over/under goals records for the season and how many times each team has won, drawn or lost the handicap market. There are also links to the official websites of the clubs. 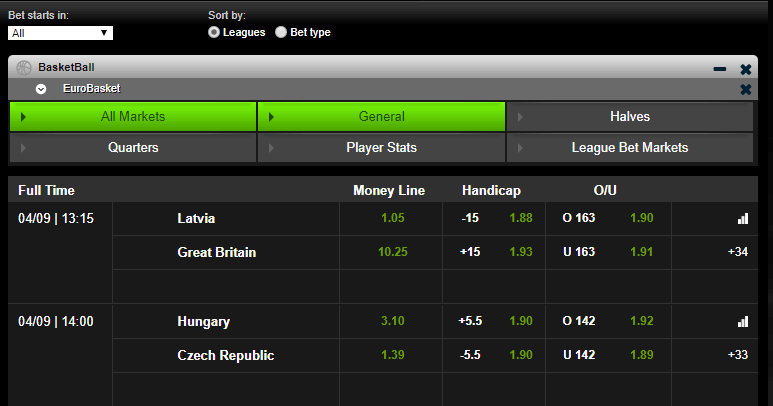 The basketball menu features odds from 8 regions and a dedicated option for international matches. The NBA in the United States is the most popular professional basketball league in the world. During the off-season, the outright section includes ante post odds for the team to win the league in the upcoming season. The women’s version of the NBA is covered with an extensive range of odds for each match. In selecting WNBA from the United States option in the basketball menu users are taken to a page which shows the time and date for upcoming matches. Odds for the money line, spread and over/under points are displayed on this page with buttons for additional markets for first half 1×2, totals and overtime betting. There is also an icon which when clicked can take you to a stats section. This section features current form and results of the most recent meetings. Over/under and handicap records are available for each team. Tennis has become hugely popular for online betting both before matches start and in-running. Bettors like the quick turnover of markets and odds change from point to point. The betting can be volatile and the odds can swing many times during a match when the balance of play switches between the players. The tennis menu is organised alphabetically by country and includes odds for the ATP, WTA, Challenge Tour and ITF tournaments for men and women. The date and projected start time are shown for each individual match but the latter is subject to change due to weather delays and the finishing time of the previous match on the court. Odds are shown for the 12 in fractional odds by default. There is a link to as many as 37 additional markets covering games, set correct scores, handicaps and set betting. A statistical section shows recent form for each player, results in head-to-head meetings showing set scores, date and tournament and individual win/loss records by surface and continent. The live betting offer can be accessed through a button on the Sports Menu and a heading on the top navigation menu on the home page. Live events are listed by sport in the following order: football, basketball, tennis, ice hockey, handball and several other minor sports. For each live event the teams, clock, and phase of the match appear on the left-hand side of the page. The current score appears prominently alongside the current odds for the main market. Links take the bettor to secondary markets for which there are as many as 35 for football but a lot fewer for tennis and the other live betting sports. The live page can be displayed in a number of views and a Live Schedule lists upcoming events over the current day and next few days. Live bet options can be located using a search facility by entering the name of a team or player. By default, an empty betting slip is displayed on the Sports homepage. 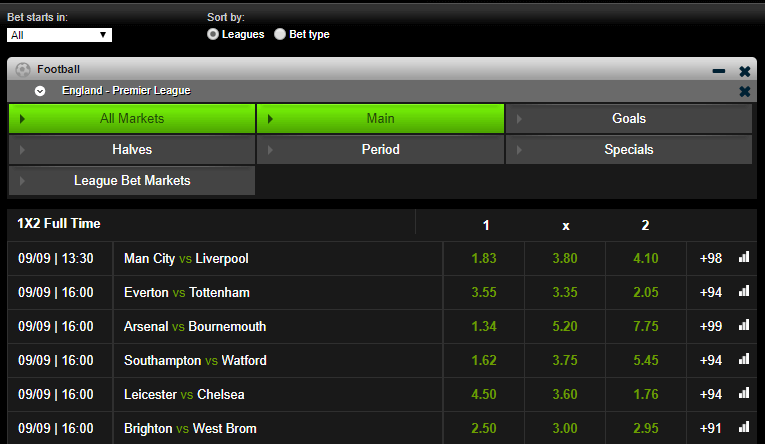 Once odds from a market have been selected the event, teams or players and market appear on the betting slip. The odds are highlighted in green next to a drop down menu for the stake unit which can be from 5 to 1000 pounds or Euro. Below the staking box, the number of bets, cost, and winnings are displayed. The default is for single bets but when additional markets are added the customer can then choose to place Combo or System bets. At any stage, you can clear all the selections and start again. The Place Bet option is clicked and the bet is confirmed and placed and account balances are updated. After bet placement, an empty betting slip is displayed again and the next bet can be placed. Mobilebet is the mobile element of the online sports betting website called ComeOn. The site has been designed for ease of use on smartphones and tablets and for playing while in transit or away from a desktop. All the main technologies (such as iOS) are covered and there is a good range of video slots, jackpot games, scratch cards, roulette and blackjack and live casino games. Customers can bet on sports and bet in running on all mobile devices and the product has been designed for convenience when moving from place to place. The casino option is the third one along from the left on the main navigation bar on the website homepage. In selecting this option you are taken to a rolling page showing the current promotions in written and graphical format. A secondary menu towards the bottom of the page includes links to the games, tournaments, and winners. A further vertical sub-menu shows the number of games available within each category. The Favourites area of the casino page displays the most popular games using names and graphics and where applicable the existing jackpot. A Players’ top lists section shows the most popular games based on the number of likes. This section of the site has the same rolling pages as the main casino area. In fact, both pages are virtually the same in terms of listings and the selection of games available. Within the live casino page, there are graphical links to the live games on offer which are: roulette, blackjack, casino Holdem, VIP roulette, immersive roulette, three card poker, and baccarat. Players must become a member before playing live games which are presented to make the gaming experience more akin to a bricks and mortar casino. A drop down menu lists the choice of games and a Mini Lobby button takes you to a page showing the most popular casino games and the number available in each category. In many ways, the live casino pages replicate the general casino section of the Mobilebet website. Email: No email address but online form. Live Chat now available to UK customers. Support from 11am to 8pm. Payments can be made using Visa and Mastercard cards, several leading payment options and fast bank transfers. Banking can be done in Euro, dollars, pounds and several other European currencies. There is a minimum deposit amount of £8 and up to £8000 can be taken out in one transaction (depending on payment and withdrawal method). Again, depending on the method, withdrawals can take up to 7 business days. Please also be aware that there can be transaction fees. Mobilebet Loyalty points can be earned by making a deposit and withdrawing funds (only on first withdrawal). Once an event has finished bets are settled promptly which means you can take out your winnings or bet again. Mobilebet are a white label sportsbook from the group that also includes ComeOn and in many ways the two websites are similar. 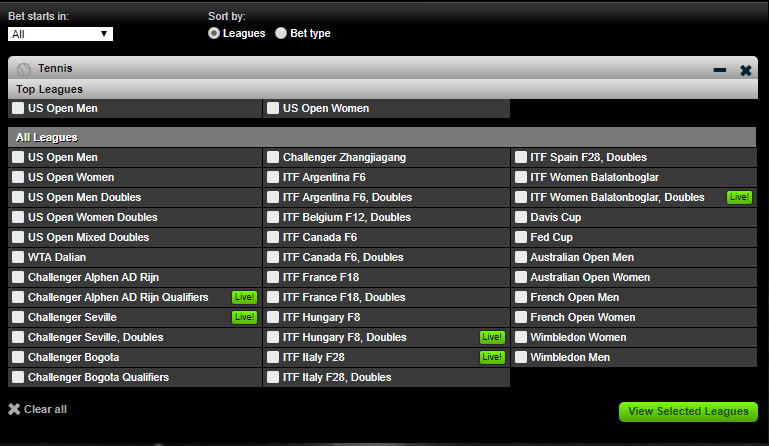 The Sports menu includes the same options for leagues, matches, and markets. Mobilebet was initially introduced to provide a casino that was particularly suited to mobile but the games can still be played on the desktop version. The website is dark with some green areas to give a sports field feel to the presentation. In all areas of the site search boxes make it easier to find an event or game. The homepage follows the regular industry standard of listing Sports first followed by Casino and Live Casino. However, unlike some competitors, there is no dedicated section for poker games (However, video poker is available). The parent company is relatively long serving players in the industry and staff are experienced in the customer requirements of online gamblers. The Mobilebet business meets the licensing requirements of the gambling commission in the United Kingdom. Furthermore, gaming security makes for a safe betting experience and financial information remains private due to encryption. Overall, the site looks appealing and the offer is extensive and varied. The service is reliable and all aspects of the site focus on usability and convenience. Get your Voucher Code for the Mobilebet Sports offer!